Boyds, Md. 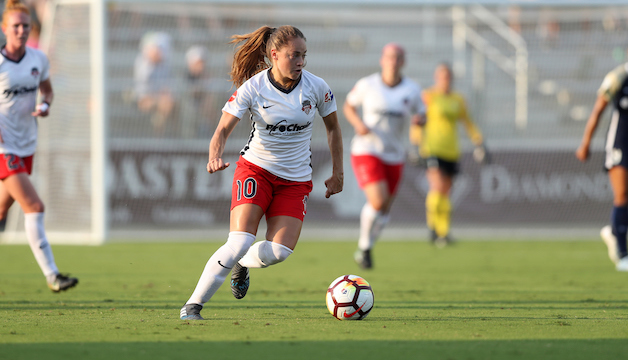 (December 4, 2018) – The Washington Spirit has re-signed forward Estefanía Banini ahead of the 2019 NWSL season. Per league and team policy, terms of the deal were not disclosed. Banini is currently spending the 2018-2019 NWSL offseason on loan with Spanish club Levante Unión Deportiva, competing in Liga Femenina Iberdrola, the highest level of Spanish women’s professional soccer. The 28-year-old Argentinian has played with the Spirit in each of the past four NWSL seasons, dating back to 2015. She previously transferred to Spanish side Valencia in October 2016, before returning to the Spirit in June 2017. During her two stints with the Spirit from 2015-2018, Banini has made 52 total appearances, scoring eight goals. She earned the Spirit 2016 Golden Boot award, scoring five goals in a seven-game stretch after returning from injury. In 2018, she appeared in 12 games for Washington, making 11 starts. She scored one goal on the season, finding the net from close range in a 3-2 road loss to the Houston Dash on May 27. Transaction: Washington Spirit re-signs forward Estefanía Banini.